Leucanthemum superbum 'Real Glory'. The photo says it all! 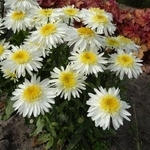 Thick green leaves topped off by large white daisies with yellow frilly centers. Unique and alluring. A strong easy-to-grow Shasta Daisy. PPAF.